Project WDD and ambitions: We need you to like our Facebook-Seite! World Drummers' Day is a non-commercial project originated from Christian Schages @ schlagzeugschule-krefeld.de in Germany. 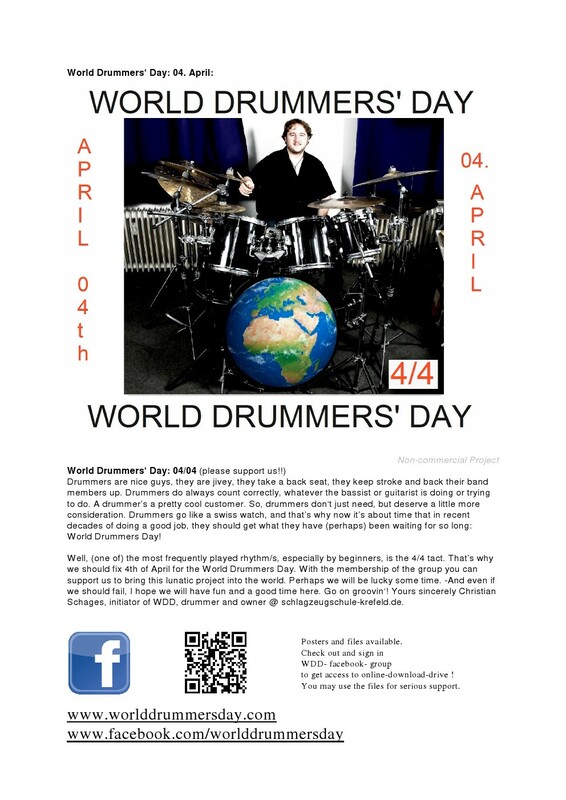 We want to establist day of glory for all drummers and percussionists all over the world every year on 04th April. First of all we need much more likes on our facebook sites to acquire supporters for this project. Everyone of you may and should celebrate WDD e.g. with (public) motto parties in your home town. But please notice and accept these conditions. You may also use the material from the Download-Server for your advertisement. I would be happy to get some feedback and to read about your ideas in the forefront. Thank you for supporting World Drummers' Day!